The strongest small cap sectors are utilities and consumer goods. The best small cap industry is auto parts. The average small cap score is 48.79. For consideration, the four week rolling average score is 48.50. The average small cap stock in our universe is trading -33.6% below its 52 week high, -1.09% below its 200 dma, and has 8.59 days to cover held short. The strongest small cap sectors are utilities and consumer goods. Financials and basic materials also score above the universe average score. 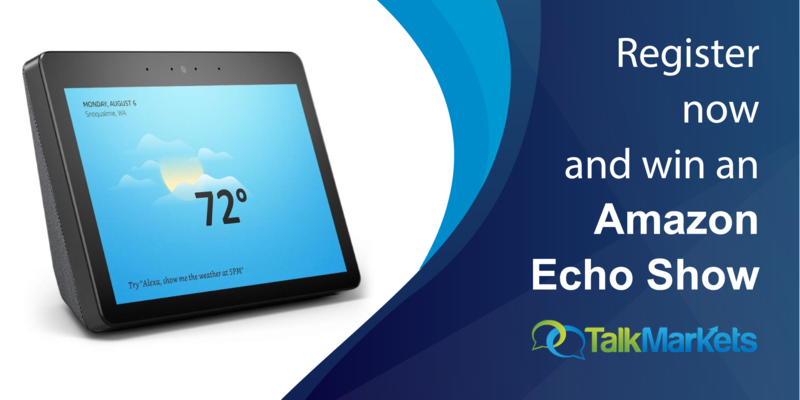 Technology and healthcare score in line. 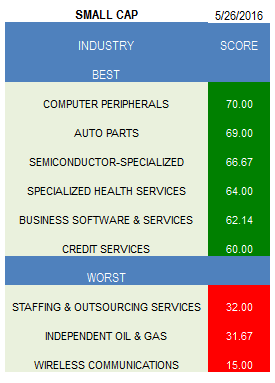 Industrial goods and services score below average. The following are the best and worst scoring in small cap. 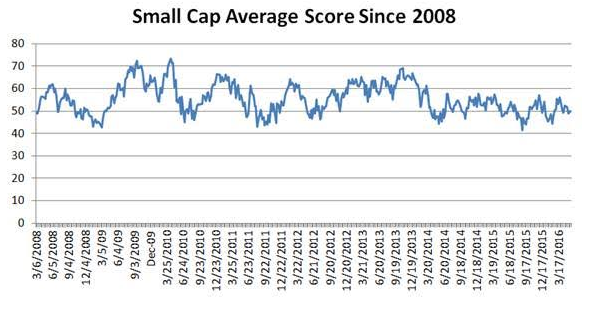 The next chart shows historical small cap average scores. 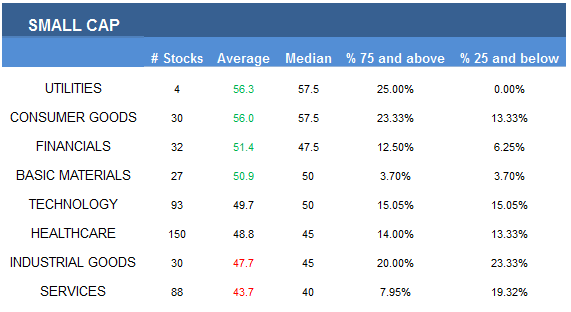 Auto parts (SRI, MTOR) score best in small cap. Other industries that are high scoring are specialized semiconductor (MPWR, QLGC, specialized health services (BEAT, USPH, AHS), business software (CSGS, PRFT, TSYS), and credit services (WRLD). The top baskets in basics are industrial metals & minerals (BOOM), steel & iron (ZEUS, AKS), and gold (SA). In consumer goods, concentrate on auto parts, processed & packaged goods (MGPI), and home furnishings (ETH). Credit services, regional banks (MBWM, LKFN), and S&Ls (NWBI, FBC) are top scoring in financials. Buy specialized health services, home healthcare (AMED), and medical instruments (IART, MMSI, LMNX, VASC, ICUI) in healthcare. 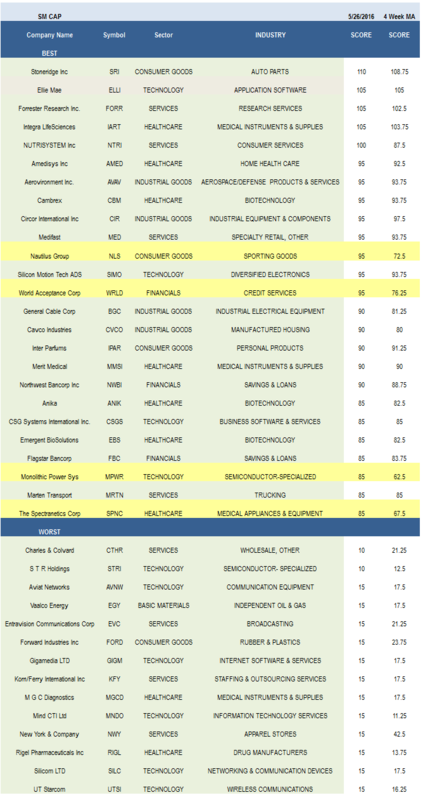 Aerospace/defense (AVAV) is top scoring in industrials and typically outperforms through the air show order season. Trucking (MRTN) is the only industry to score above average in small cap services. Specialized semi, business software, and semi equipment (UTEK, KLIC) are high scoring in technology.